Two F-14A Tomcats from Fighter Squadron Two (VF-2), known as the 'Bounty Hunters' from Miramar, California, surpassing the speed of sound (Mach One) as they thunder by the aircraft carrier USS Ranger (CV-61). A condensation cloud surrounds each of the Tomcats as they break the sound barrier at approximately 770 miles per hour. The phenomenon of the bursting cloud is caused by humidity in the atmosphere condensing on the shock wave as the airflow over the aircraft increases past Mach One. 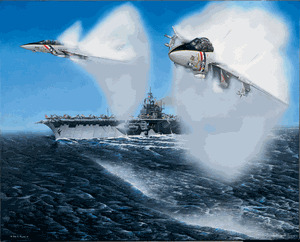 As the two Tomcats, or "Mach Busters," pass low over the ocean, the disturbance from the shock waves churns up the water's surface.